Nearly an hour after Fox News predicted the Democrats would regain the House, moments ago NBC confirmed as much, and called the House for the Democrats. 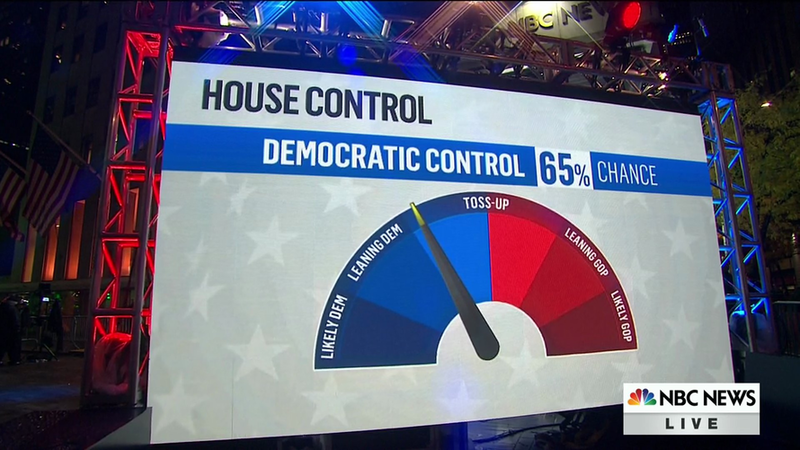 NEW: We're projecting Democrats have won control of the House at @NBCNews. As Bloomberg adds, the projections from NBC and Fox reflect good trends for Democrats in the recent calls: namely, that they're continuing to flip the races where they were favored, and picked off the occasional toss-up. CNN is projecting that Democrats could win up to 35 seats. Republicans have picked up 2 Senate seats, though 11 races remain undecided. Assuming those trends hold, they should be able to take the Speaker's gavel. But there's a lot to be decided about what kind of governing majority Nancy Pelosi will have. And, as we reported earlier, NBC also called the Senate for the Republicans, which means that after the 2016 fiasco, this time conventional wisdom was correct, and consensus - Dems get House, GOP keeps Senate - was right. 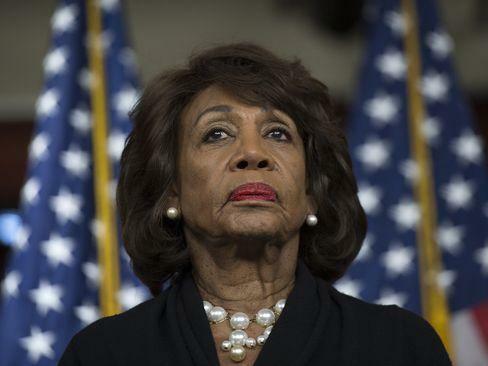 Which means that in addition to Nancy Pelosi, who is set to become the new House Speaker, Adam Schiff taking over the House Intelligence Committee, and Elijah Cummings becoming the news Oversight Committee chair, the new chair of the House Financial Services committee will be none other than Maxine Water. Waters has frequently clashed with Trump, calling for his impeachment - and earning a nickname as "low IQ" from the president. She's signaled she'll likely be an aggressive watchdog on the panel, as she sought (unsuccessfully) to subpoena Trump family records from Deutsche Bank AG and opposed a bipartisan effort to scale back some elements of Dodd Frank. That hasn't stopped President Trump from spinning the night as an unmitigated win. 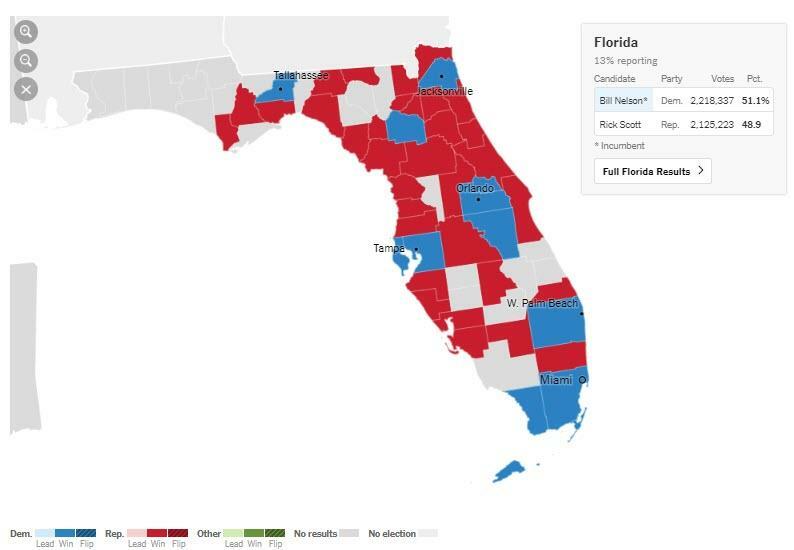 The White House is spinning the night as better-than-expected, and to the extent that both chambers didn't flip and Fla gov remains in GOP hands, it is. But. The House is flipping and the extent of the investigations is almost certain to be jarring. Here's a roundup of some other key late-breaking races. In what was perhaps the biggest House upset in Democrats' favor, voters in the normally red 11th Congressional district on Staten Island and in South Brooklyn gave the upset to Democrat Max Rose, who topped the former Staten Island District Attorney 52% to 48%, with 92%. Democrat Andrew Gillum has conceded to Republican Ron DeSantis in the tight Florida governors race dealing a major blow to Dems hopes of retaking governorships. Gillum, the mayor of Tallahassee, was vying to be Florida's first black governor. Former Tennessee Titan Democrat Colin Allred defeated House Rules Committee Chairman Pete Sessions in his Dallas-area district, winning another major victory for Dems. Fox News is projecting that Democratic incumbent Senator Claire McCaskill has been defeated by her GOP opponent Josh Hawley. Former CFPB head Richard Cordray lost his bid to be Ohio's next governor. Jared Polis has become the first openly gay man to win a governor's race, besting Republican Mike DeWine in Colorado. Boston's Ayanna Pressley has become the first black woman elected to Congress from Massachusetts (she famously defeated a long-time Democratic incumbent in a primary earlier this year. On the same tip, "girl from the Bronx" Alexandria Ocasio-Cortez has become the youngest woman ever elected to Congress at the age of 29. She defeated Democratic leader Joe Crowley in a primary in the spring. Democrat Laura Kelly defeated Kris Kobach to turn the Kansas governorship blue. Republican Brian Kemp is ahead of Stacey Abrams in the race for Georgia governor by 10 points with 81% of precincts reporting, according to CBS. Abrams, who was endorsed by several celebrities, including Oprah Winfrey. North Dakota Democratic incumbent Heidi Heitkamp lost to Republican challenger Kevin Kramer. Democrats are presently winning all four Iowa congressional districts, including the seat of Rep. Steve King. Update 22:15 EST: After a series of surprising wins in key Senate races, NBC now projects Republicans will retain Senate control. At the same time, however, it now looks almost guaranteed that Republicans will lose control of the House. Update 22:10 EST: After the earlier fiasco, in which CBS called Texas for Beto O'Rourke only to correct itself, moments ago ABC called the Texas Senate race for Ted Cruz. Despite the Cruz setback. the Democrat wins in the house continues with CNN projecting: Sharice Davids wins KS03, Chrissy Houlahan wins PA06, Dean Phillips wins MN03, Max Rose wins NY11. CNN projects: Sharice Davids wins KS03, Chrissy Houlahan wins PA06, Dean Phillips wins MN03, Max Rose wins NY11. With these wins, the Democrats only need another 15 turns to take control of the House. Update 22:00 EST: Mitt Romney has won the senate race in Utah; as Republicans Hold another key Senate seat. Meanwhile, as Bloomberg reports, "Democrats are picking up congressional seats across the country, but not at a rate that would suggest a wave. 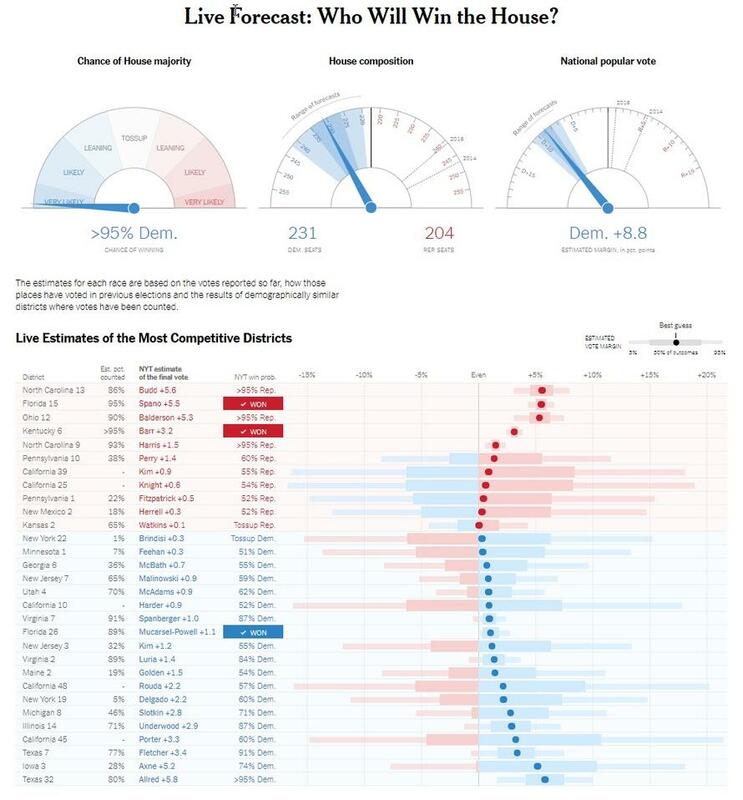 The race for control of the House remains close, with projection models still predicting a flip of the lower chamber." At the same time, the path to Senate control looks almost non-existent for Democrats, following losses by Sen. Joe Donnelly in Indiana and Marsha Blackburn's hold of Tennessee's Senate seat. According to the latest PredictIt odds, after being tied with the Democrats as recently as an hour ago, the Republicans odds of keeping the House have tumbled to just 10%. Meanwhile, with the Trump Hotel bar in DC reportedly "at capacity", President Trump (who is at a private reception in the White House) is greeting supporters and shaking hands. Tennessee's Marsha Blackburn is leading Democrat Phil Bredensen (who was famously endorsed by pop sensation Taylor Swift) in the race for Bob Corker's Senate seat, putting her on track to become Tennessee's first female Senator. Meanwhile, Dems have picked up two key seats in Pennsylvania's 5th and 17th districts, widening the Dems win rate for 'flippable' seats to 4 and sending odds that the GOP will retain control of the House tumbling. 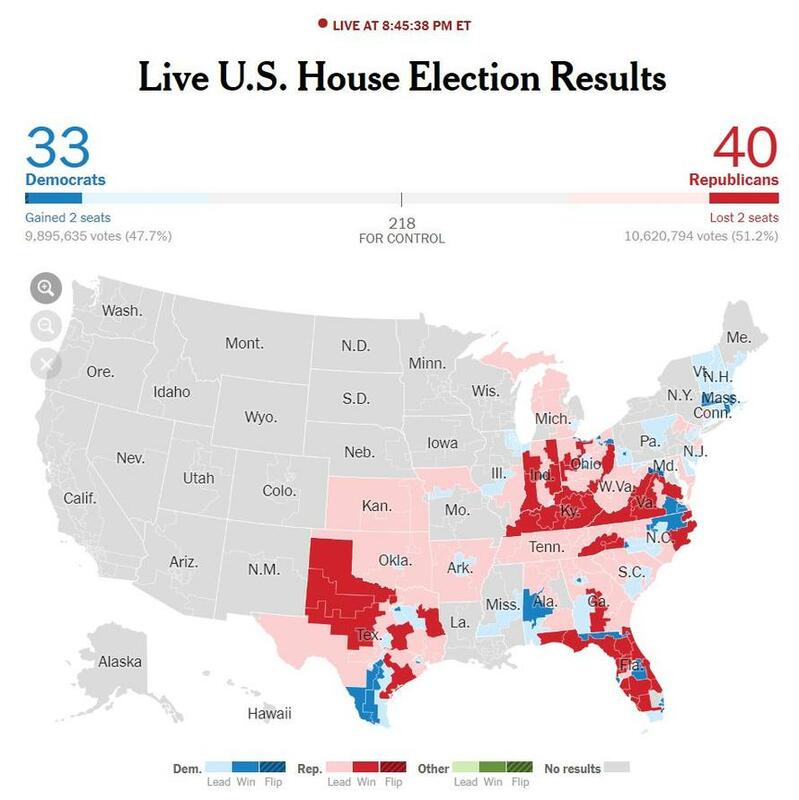 Update 21:15 EST: 538's forecasting model is now placing Republican odds of winning the House back below 50% to 45.7%. 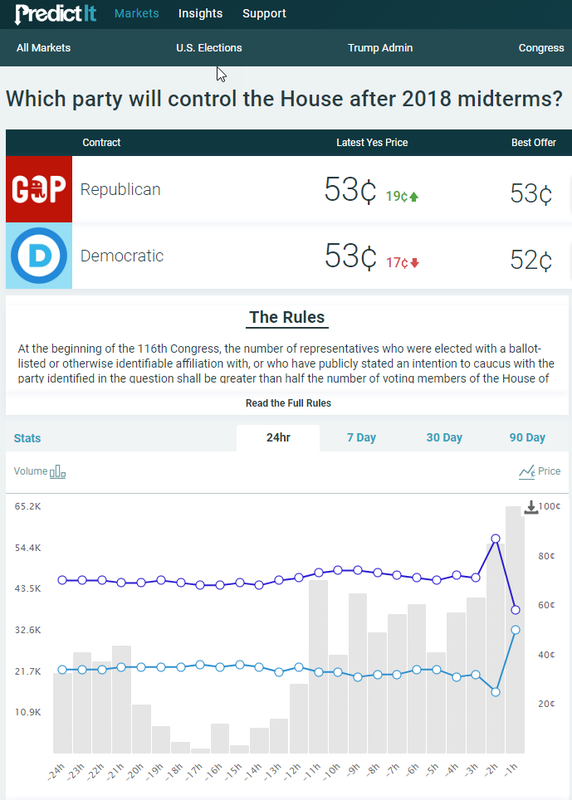 But online betting markets are still more optimistic, with PredictIt seeing the GOP essentially deadlocked for control of the House. Meanwhile, New York City's Alexandria Ocasio-Cortez has officially become the youngest woman ever elected to Congress at the age of 29, winning more than 80% of the votes in New York's 14th Congressional district. In Texas, Beto O'Rourke's lead briefly shrunk to just 79 votes (O'Rourke: 2,196,196 Cruz: 2,196,117). In North Dakota, Democrat Heidi Heitkamp is way behind with 38% of the vote compared with Republican Kevin Cramer's 62%. Meanwhile, Nancy Pelosi speaking at a campaign event in Washington proclaimed that Democrats "will win tonight" and said her majority will run a Congress that is "open" and "transparent." This as Bloomberg pointed out that even a narrow win in the House will prompt "soul searching" for Democrats. If Democrats lose both the House and Senate tonight, it will be a catastrophic defeat for both the party and its policy goals. But even a narrow victory in the House that comes in below expectations will prompt some soul-searching. Leaders in the party are likely to openly question whether an avowedly liberal presidential candidate would be best suited to take on President Donald Trump in 2020, when the party will need to recapture swing districts and states. A narrow victory will also increase the governing headaches for Democratic leaders, and could even endanger Nancy Pelosi's bid to become the first woman re-elected as Speaker. Of course, there's still a lot of votes to be counted. Update 21:00 EST: It's 9 pm on the East Coast and polls have officially closed in most of the country. The upshot according to a summary from BBG is that Republicans are performing better than expected, though Dems have so far averted any major disasters. Polls in nine states close at 9pm, meaning that voting has concluded in the majority of the country. So far, things are trending well for Republicans. Toss-up districts in Kentucky and Florida have gone to the GOP, and they've held on to seats where Democrats might have been competitive in a so-called tsunami. There's also reason for GOP optimism in the Senate, with Sen. Joe Donnelly, a Democrat, appearing unlikely to win re-election in Indiana. That makes a surprise Democratic victory in the upper chamber unlikely. Still, Democrats avoided disaster in New Jersey's Senate race and have flipped some House districts where they were favored. Here's a summary of the remaining tossups. While Democrat Joe Manchin has successfully defended his West Virginia Senate seat from Republican challenger Patrick Morrisey, in Texas, what looked like a promising race for Dems early on has transitioned into a tossup as Ted Cruz has eroded insurgent Democrat Beto O'Rourke's early double-digit lead. As of 9 pm, Democrats must pick up 21 more Republican seats and not lose any of their own to win the House. 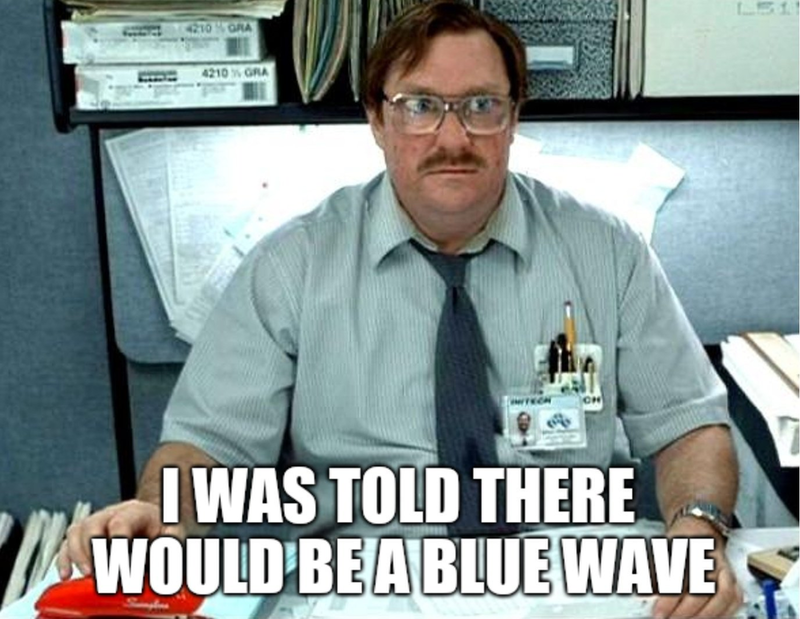 But perhaps most telling of all, CNN's Jake Tapper has proclaimed: "This is not a blue wave." Update 20:45 EST: Democratic incumbent Joe Donnelly has lost to Republican challenger Mike Braun in Indiana, a major blow to Dems that means Republicans will likely expand their majority in the Senate. Trump had made defeating Donnelly a priority, even visiting Indiana on Monday in his pre-midterm rally blitz. Pollsters have called it: The GOP has won the Senate. And as Lexington Kentucky's Andy Barr has won re-election, defeating Amy McGrath and dealing a major blow to Democrats' ambitions for winning a solid majority in the House. Republicans are now favorites to win the House and Senate, according to real-time polls and online betting markets. For those keeping score at home, the GOP has retained two competitive seats (VA5 and KY6), while Dems have swung two (VA10, FL27). Meanwhile, Florida Gov. Rick Scott is pulling ahead of incumbent Dem Bill Nelson in the race for Nelson's Senate seat. In New Jersey, Democrats have dodged what would have been a major blow to their Congressional ambitions now that New Jersey's Senate Race has been called for Bob Menendez. Menendez has managed to win a third term, averting what would have been the first Republican senatorial victory in New Jersey since 1972, despite being admonished by the Senate in April for accepting unreported gifts and travel from a friendly Florida doctor who is now imprisoned on insurance fraud charges. That admonition came after Menendez survived a trial, and then was acquitted during a retrial, on corruption charges of his own. The Feds dropped their case against Menendez afterwards, but doubts about Menendez's ethical bearings helped make the race somewhat competitive. Menendez defeated Republican Bob Hugin, a former chairman of Celgene Corp., a millionaire who self-funded his campaign. 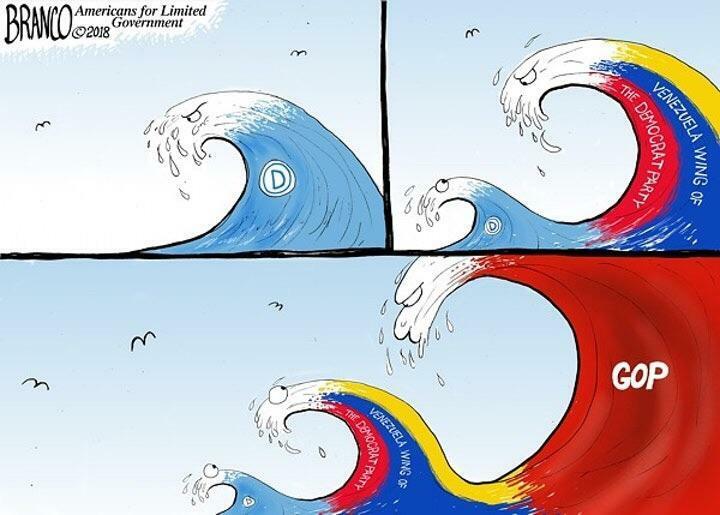 Bloomberg is reporting that hopes for a "blue wave" type victory have continued to fizzle, as Republicans are still easily winning seats that would have been competitive if Democrats had a real shot at a sweeping victory. 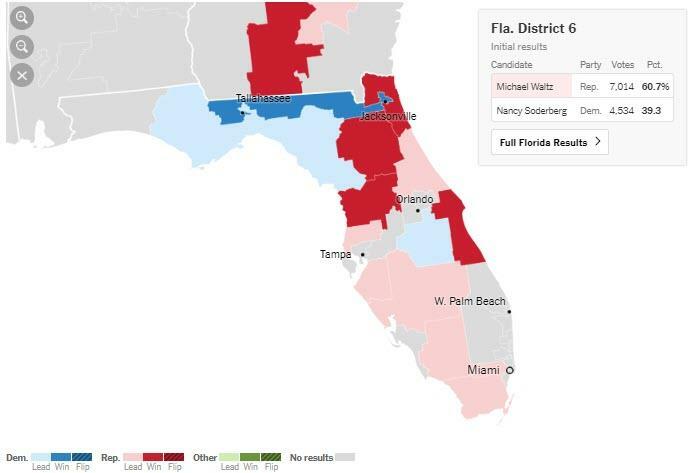 Case in point: CBS News has declared the open seat in Florida's 15th congressional district will likely go to Republican Ross Spano, meaning that Dems have missed another important opportunity to flip a seat. As the odds that Democrats will win a large majority in the House sink, pollster Nate Silver revealed that he's switching his forecasting models to a more conservative setting. Well, I'm trying to do 6 things at once -- we think our live election day forecast is definitely being too aggressive and are going to put it on a more conservative setting where it waits more for projections/calls instead of making inferences from partial vote counts. Even NBC News is also seeing odds of a Democratic House takeover shrink. Update 20:26 EST: Not so fast on the blue wave: moments ago, online forecasting site FiveThirtyEight lowered its odds for Democrats to take a majority in the House to just 54.5% chance; down from 90% in its first forecast. Update 20:20 EST: And now some good news for Republicans, who managed to hold Florida's 25th district, where Rep. Mario Diaz-Balart is projected to win re-election, according to AP. That was another seat where if we were seeing a "Blue tsunami", the Republican could have been in trouble. Update 20:10 EST: Former DNC chairwoman Debbie Wasserman Schultz has won re-election in Florida. Meanwhile, another flip has taken place for Democrats, with NBC News reporting that Donna Shalala has won the race to replace retiring GOP Rep. Ileana Ros-Lehtinen in Florida. And yet, as Bloomberg notes, in somewhat encouraging news for Republicans, "in the latest forecast Democratic chances of controlling the House have slipped to 4 in 5, according to FiveThirtyEight, while Republican odds of holding the Senate are now 14 in 15. Still, that suggests the GOP needs a remarkable run of good luck to hold onto the Speaker's gavel." Update 19:55 EST: In the first major upset of the night, Jennifer Wexton is projected to defeat two-term Rep. Barbara Comstock in Virginia's 10th district in one of the most closely watched House races in the country. Comstock had been one of the Democrats’ top targets of the 2018 cycle. Hillary Clinton prevailed over President Trump by 10% points in 2016 in Virginia's 10th District, an affluent, well-educated suburb just outside of Washington, D.C. In fact, as Bloomberg notes, the Va-10 district located near Washington is the highest-income district which was presently held by a Republican. The median household income in the district is $122,092, according to Census Bureau estimates. 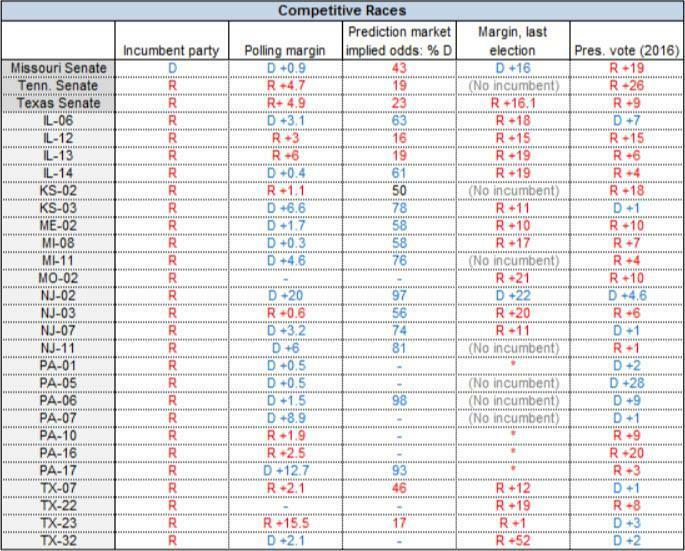 Meanwhile, with 16 Democrats now leading in Republican districts, forecast models show that Democrats remain favorites to take the House and Republicans remain favorites to retain control of the Senate. Meanwhile, at 7:30, polls will close in Ohio, North Carolina, and West Virginia. 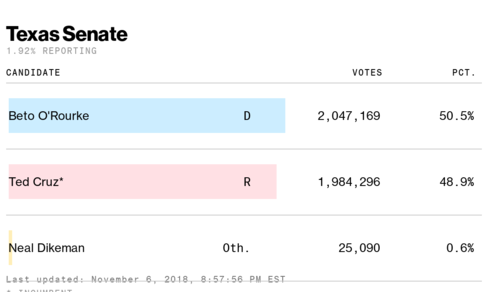 A few race updates via Bloomberg: Prominent Democrats, including presidential candidate Bernie Sanders and Hillary Clinton's running mate, Tim Kaine, have won re-election to the Senate. Republicans have held serve across districts in Kentucky and Georgia where they were expected to win, and GOP South Carolina Governor Henry McMaster won re-election. Update 19:16 EST: With votes in the Florida House race coming in fast and furious, 3 Republican incumbents have won reelection in the Sunshine state, while 1 Democrat has won in the north. Update 19:10 EST: One hour in, where do we stand? 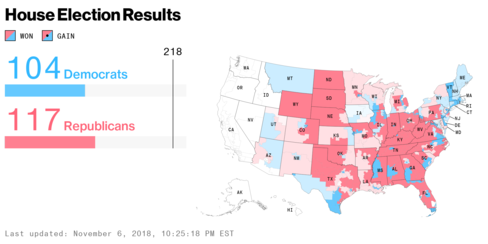 As BBG's Justin Sink writes, if Democrats or Republicans are outperforming expectations tonight, we'll soon see it in some of the races that just closed. Some examples: Democrats are hoping to take advantage of GOP retirements in Virginia's 5th district and Florida's 15th district, despite both races being in Republican-leaning areas. If Republicans are competitive in Florida's seventh district or New Hampshire's first - both currently represented by Democrats - that would send up warning flares among a party looking to gain - not lose - seats, and it will finally be time to mercifully put all remaining pollsters out of a job. Update 19:00 EST: Polls are now closed in South Carolina, Vermont, Virginia, Georgia and most of Florida. As noted previously, a key Georgia races to watch is in the 7th District where Republican Rep. Karen Handel is seeking re-election against Democratic challenger Lucy McBath, a former flight attendant turned gun activist. Meanwhile, according to Bloomberg commentator Justin Sink, "one of the biggest opportunities for Democrats tonight is in Virginia, a state where the party outperformed predictions in the off-year races a year ago. The 10th district - which voted for Clinton over Trump by a 10 point margin - is a key pickup opportunity, where Barbara Comstock is at risk of losing to Democratic state senator Jennifer Wexton. Downstate, Democrats would like to pick up a seat in the 2nd or 7th districts. Losses there would signal the party is well positioned for the rest of the night, and knocking out David Brat - who rode a Tea Party wave to a surprise victory over establishment Republican and Majority Leader Eric Cantor in the 7th district in 2014 - would represent a major victory for Democrats. Another critical race to watch. 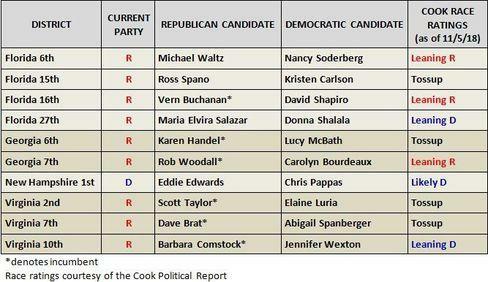 Update 18:56 EST: These are the key house races to watch at 7pm according to the Cook Political Report. Update 18:50: At 7PM, polls are closing in Florida, Georgia, Indiana, Kentucky, New Hampshire, South Carolina, Vermont, and Virginia. As previewed earlier, these states are home to some of the most interesting races of the night, and depending on how they turn, we should get a good sense for how the night is going to go according to BBG's Justin Sink. Update 18:45 EST: There will be a lot of interim updates with marginal votes trickling in, which is why as Daniel Nichanian notes, take a deep breath for now. Update 18:35 EST: In the first called race of the night, AP says that Republican Hal Rodgers has been projected to retain his seat in Kentucky's 5th District. 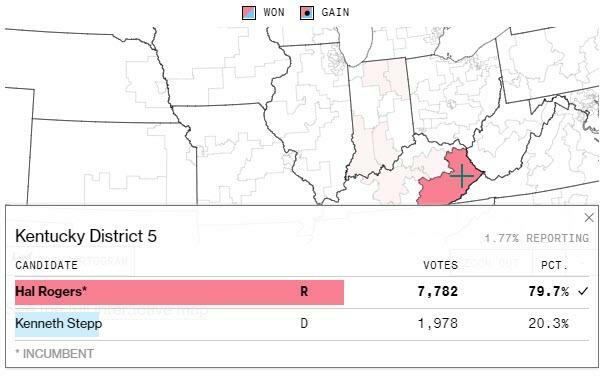 Hardly a surprise, the 80-year-old has retained the safely Republican district he's represented since 1981. Update 18:00 EST: The first polls have now closed in Indiana, Kentucky. 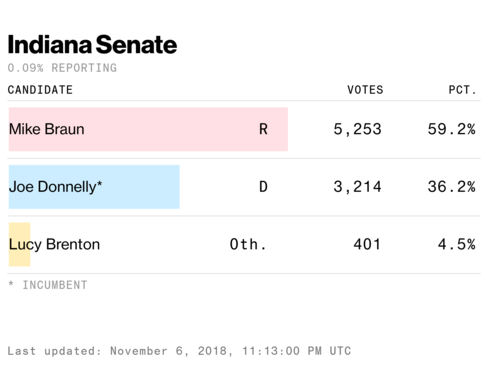 According to early results, the GOP candidate for Senate Mike Braun in Indiana is leading the Democratic incumbent Joe Donnelly. Donnelly needs to hold on for his party to maintain a chance at flipping the upper chamber. ... while in a key Indiana race for the House, GOP candidate Hollingsworth is leading Dem. Watson. Across the border in Kentucky, in another key race, incumbent GOP candidate Barr is leading Dem. McGrath in the 6th District by a wide margin in early polling. If McGrath can not win the seat, the Democrats may face a tougher uphill battle in winning the house than most pollsters expected. Update 19:37 EST: Greg Pence, Vice President Mike Pence's brother, is projected to win election to the House in Indiana. At the same time, Democrat Wexton is projected to wins Virginia's 10th Dist. House Race according to NBC. Meanwhile, in the Florida Senate race, it's neck and neck so far with more than 3 million votes counted; Rick Scott and incumbent Bill Nelson have been trading the lead. Meanwhile, as Bloomberg reports, early voting totals hit 38.5 million ballots cast and could top 40 million as states report their final tallies. Voting experts credit President Trump -- without him, "we wouldn't have this level of interest," said Michael McDonald, an associate professor of political science at the University of Florida who runs the United States Elections Project. Elsewhere, according to early NBC Exit Polls, "One In Four Hispanics Say They Cast a Midterm Ballot for the First Time in 2018. 1 in 5 for African Americans. 1 in 10 for whites." US stocks levitated for much of Tuesday's session as voters took to the polls in a midterm election that has seen one of the biggest turnouts in recent history, and has been dubbed "the most important midterm election in generations." At stake is control of the House and Senate, which, if Wall Street analysts' "baseline" expectations are to be believed (expectations that are based on polling data from the same firms that spectacularly failed to predict the rise of President Trump) Democrats will pick up at least 30 House seats - seven more than the 23 needed to flip control of the chamber - while Republicans pick up anywhere between two and four Senate seats (enough to shore up their razor-thin 51-49 majority). The first polls will close in parts of Indiana and Kentucky at 6 pm ET, followed by Georgia (though polls in Gwinnett County could remain open due to voting machine complications), South Carolina, Vermont, Virginia, as well as parts of Florida, Indiana, Kentucky and New Hampshire at 7 pm. North Carolina, Ohio and West Virginia will follow at 7:30 pm ET. 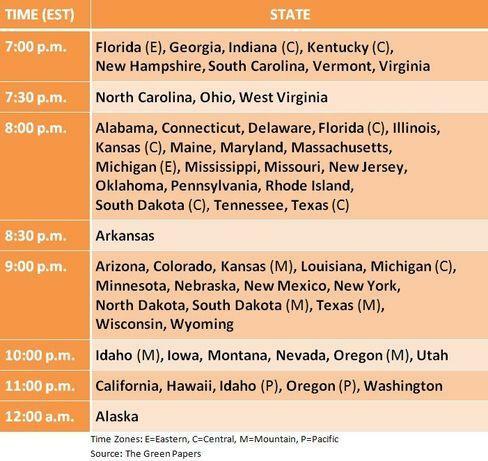 Polls in Alabama, Connecticut, Delaware, Illinois, Maine, Maryland, Massachusetts, Mississippi, Missouri, New Jersey, Oklahoma, Pennsylvania, Rhode Island and Tennessee will close at 8 pm, while polls in Kansas, Michigan, New Hampshire, North Dakota, South Dakota, Texas and parts of Florida will close at 8 pm. 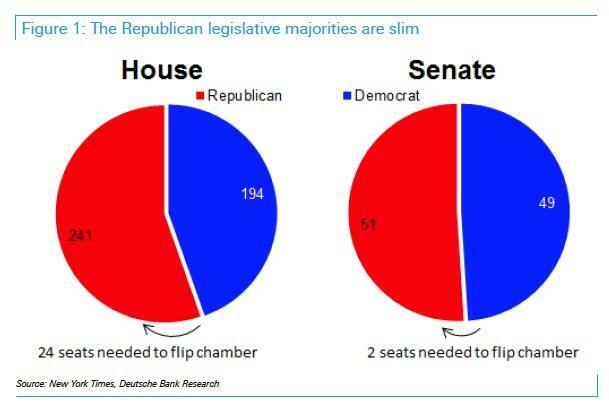 By this time, investors should know whether Republicans will retain control of the Senate. Polls in Arkansas will close at 8:30 pm, while polls Arizona, Colorado, Louisiana, Minnesota, Nebraska, New Mexico, New York, Wisconsin, Wyoming, parts of Kansas, Michigan, North Dakota, South Dakota and Texas will close at 9 pm. Polls in Iowa, Montana, Nevada and Utah, as well as parts of Idaho and Oregon, will close at 10 pm. Polls in California, Hawaii and Washington, as well as parts of Idaho and Oregon close at 11 pm. 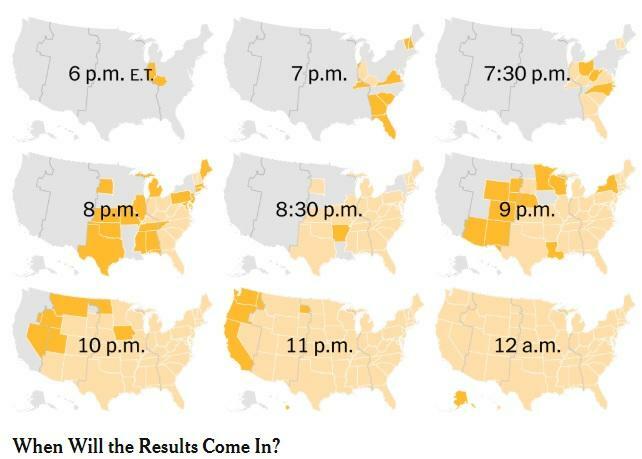 Finally, polls in Alaska close at midnight (poll closure times courtesy of the Seattle Times). The main event in the first states to close will be the Indiana Senate race, where Democratic incumbent Senator Joe Donnelly holds a slim lead in polling over Republican Mike Braun, but has only averaged about 44% in absolute support. Florida and Virginia are likely to be most in focus. An upset win by Republican Governor Rick Scott over Democratic Incumbent Senator Bill Nelson would all but ensure a Republican Senate majority. 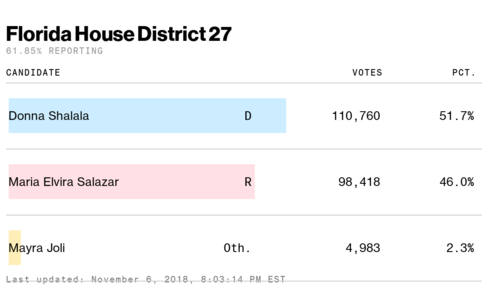 In the House, if Democrats cannot win the Republican-held seat in FL-27, they might not be on track for a majority after all. On the other hand, if Democrats win FL-26, they could be on track for a slim majority, and if they win FL-15, they could be on track for a large majority. In Virginia, there are three bellwether races: If Republicans hold onto VA-10, they might have a very good night. If they hold onto VA-07, they have a shot at maintaining the majority. By contrast, a Democratic win in VA-02 would signal a more substantial Democratic majority is likely. Incumbent Democratic Senators Brown (OH) and Manchin (WV) appear very likely to win reelection but an upset would all but guarantee a Republican Senate majority. 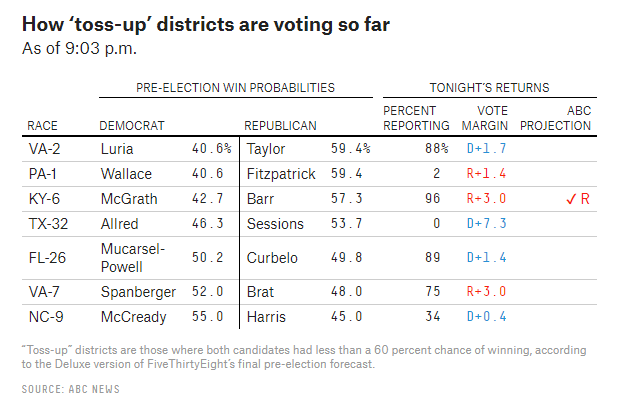 In the House, if Democratic challenger Dan McCready can wrest NC-09 from Republican control, Democrats will likely be on track for a majority. Democratic wins in NC-02 or NC-13 would send just as strong a signal. Democratic wins in OH-01 or OH-12 would suggest a Democratic majority is likely as well. The outcome of the Senate majority should start becoming clear by 8pm. If Democratic incumbent Senator Claire McCaskill wins another term, it would be difficult for Republicans to gain net seats and could, depending on how other races go, keep open the path to a narrow majority. That path would also likely run through Tennessee, where former Governor Phil Bredesen is challenging Rep. Marsha Blackburn for the open Republican-held seat. Short of winning in Tennessee, Democrats would need to win the Senate seat in Texas held by incumbent Senator Ted Cruz, which looks even more challenging. If Democrats cannot win Missouri and Tennessee (or Texas) they are unlikely to win the Senate majority. 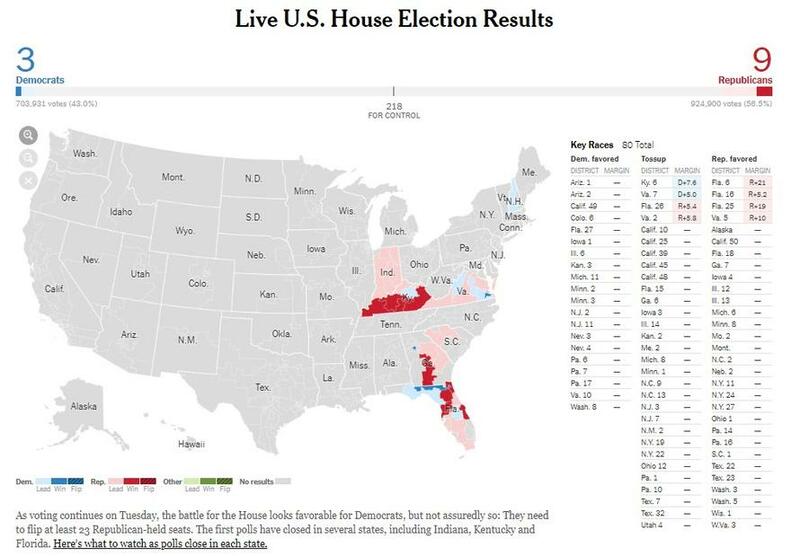 In the House, if a "blue wave" has formed it should be apparent in the results from states with polls closing at 8:00pm. Four Republican-held seats are expected to flip to Democrats as a result of redistricting in Pennsylvania (PA-05, PA-06, PA-07, PA-17), with another expected to flip to Republicans (PA-14). PA-01 could be a bellwether; if Democrats cannot win in this Clinton-won district they might have trouble winning the majority. In New Jersey, Democrats look likely to pink up at least 3 or 4 seats (NJ-02, NJ-03, NJ- 07, NJ-11); if they cannot manage to win more than two, Republicans might hold onto the majority. In Texas, the outcome in TX-32 should be watched; that district narrowly supported Sec. Clinton in 2016 at the same time it voted for Republican Rep. Pete Sessions by more than 50%. A Republican loss here would signal a high probability of a Democratic majority. At this point the general direction of the House elections should have become clear, but the Senate might still be in play. The main focus will be the Republican-held seat in Arizona, which Is the Democrats' best pick-up opportunity in the Senate this year. 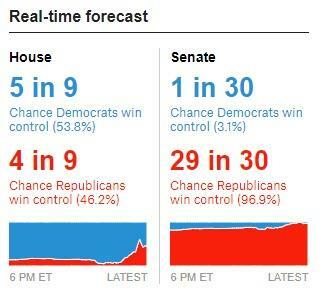 Control of the Senate should become clear with the races that close at 10pm ET. Democratic Senator Heidi Heitkamp (N.D.) trails in most polling, but Democrats have a shot of offsetting a potential loss there with a pick-up in Nevada, where the race is close to tied. Incumbent Democratic Senator Jon Tester leads polling in his reelection effort, but with a fairly narrow margin. If the House majority is shaping up to be a close call, the results in California and Washington state could be decisive. Democrats probably need to flip at least 3 or 4 of the Republican held seats in California and Washington to win the majority. This might not be too much of a challenge, given how many of these Republican-held seats voted for Hillary Clinton in 2016. Partly due to the enthusiastic turnout driven by the intensely divisive campaign, chaos has erupted at polling places across the country as voting machine malfunctions (some of which were caused by equipment issues, and others by plain-old incompetence) drew intense media scrutiny. Four of the 156 polling stations in Georgia's Gwinnett County - a crucial battleground in Georgia's narrowly contested governor's race - shut down temporarily because - get this - officials didn't bring power cords to charge the machines that generate Georgians electronic voting-ID cards. Voters were eventually given the option to vote with paper ballots at three of the four sites. The New York Times described Gwinnett as a "rapidly diversifying patchwork of suburbs" that was a Republican stronghold for decades until Hillary Clinton carried the county in 2016. The county is reportedly asking a judge about extending the voting hours past the 7 pm closing time. Problems voting were also being reported in other states, including Pennsylvania, Tennessee and Arizona. For the Democrats to wrest control of Congress and usher in an era of divided government, Democrats need to win at least 23 seats to flip the House; 2 seats would be needed to flip the Senate. 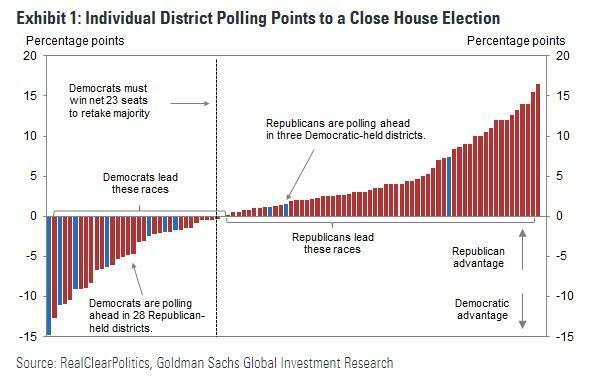 As Goldman pointed out earlier, the Democratic advantage in the 23rd through 26th seat averages less than 1pp, suggesting that from a bottom-up perspective the outlook for the House is fairly uncertain. Though at the very least, Democrats have history on their side, since the president's party typically sees an electoral wash in the midterms following a presidential vote. Though it is harder to infer powerful trends from historical experience. This cycle, the election map looks very favorable to the Republicans. Of the 35 seats being contested, 26 are currently held by Democrats. Of those Democratically-held seats, 10 are in states that voted for Donald Trump in 2016. In contrast, Republicans are only defending eight states, and only one of those voted for Hillary Clinton. 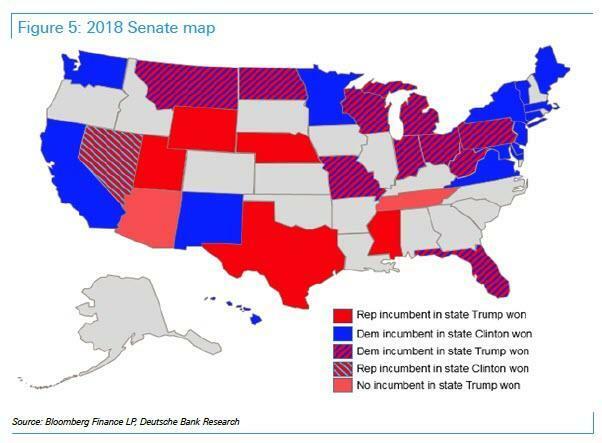 Deutsche Bank laid out the electoral map in the chart below. In addition to voting for House, Senate, statewide and local races, referendum questions on issues ranging from marijuana decriminalization to abortion access are appearing on the ballot in several states. Here's a roundup of some of the more high-profile issues, via the New York Times. Legalizing the recreational use of marijuana is on the ballot in Michigan and North Dakota. The North Dakota initiative, Measure 3, would also expunge marijuana convictions from criminal records; the Michigan initiative, Proposal 1, would not. Medical marijuana is on the ballot in Utah and Missouri. Missouri has three separate initiatives that would legalize medical marijuana: Amendment 2, Amendment 3 and Proposition C.
In Washington State, voters will weigh in on Initiative 1631, which would charge companies and utilities that burn fossil fuels $15 for each ton of gases they produce (the penalty would rise over time). It is one of several ballot measures across the country that aim to fight climate change, including a statewide fracking ban in Colorado and renewable energy requirements in Arizona and Nevada. A ballot initiative in Massachusetts, Question 3, will ask voters if they want a landmark 2016 transgender rights law to remain on the books. The law, which was passed by the Democratic legislature and signed by the Republican governor, prohibits discrimination based on gender identity in public places, like bathrooms. Question 3 is the first-ever attempt to undo a transgender rights law at the ballot box. In Washington and Oregon, voters will decide on measures to prohibit local taxes on food sales. Companies like Coca-Cola and PepsiCo have backed those initiatives as a way to combat taxes on sugary drinks like soda, which are an increasingly popular public health tool. Voters in West Virginia and Alabama will decide on constitutional amendments that would specify that there is no guaranteed right to abortion in those states. The proposals would not ban abortion if they were to pass, but that could change if Roe v. Wade were someday overturned. Having reviewed the possible scenarios that lie ahead, it's time to take a look at what lies ahead for markets: to assess the medium-term market impact of the midterms and recommend trade ideas, SG strategists worked under three different scenarios according to the election outcome. 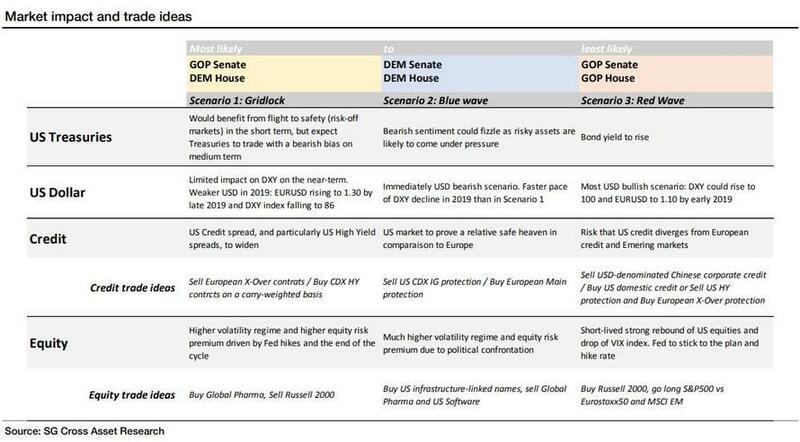 Scenario 1: Gridlock - GOP Senate and DEM House (most likely): Markets would fear that economy would be more vulnerable from now on with the absence of any further economic stimulus in the event of economic slowdown. Scenario 2: Blue Wave - DEM Senate and DEM House: Markets would stir on speculation of a lame duck presidency and potential impeachment proceedings. Potential upside risk on Infrastructure. Looking ahead, barring no major upsets, analysts at Deutsche Bank and other Wall Street banks see potential for the market to rally into the end of the year, with some analysts who were only recently calling for an extended losing streak now seeing potential upside of between 11% and 14%. But then again, with so much uncertainty between now and then, market returns - and analysts' expectations - could shift dramatically between now and then.